The Pauline Harvey Collection consists of eisteddfod certificates, programs, photographs, eisteddfod trophies, dancing costumes, accessories and props, all dating to circa 1940s. Pauline Harvey (nee Peggy Kenyon) began her dancing career in Wagga at the age of 5 years. Ballet, tap dancing, clog dancing, national character, demi-character, song and dance, Irish dancing, Highland dancing and acrobatics were all taught to Pauline at the dance studio of Miss Madge Wallace. 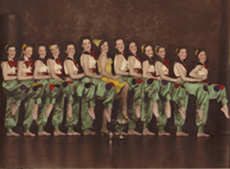 Along with the annual concert, performing in the City of Wagga Eisteddfod was the highlight of the dance calendar for Pauline and other students of Miss Wallace's studio. Long hours of practice were put in and costumes were designed and made by Miss Wallace and the mothers' of the dancers, including Mrs Kenyon. Restrictions on materials during the years of WWII pushed many mothers to become quite innovative when making costumes. Recycled fabrics and trims and clever redesigning of dancing costumes became the hallmark of the war years. Transport to eisteddfod events in Wagga was also governed by wartime restrictions. 'During WWII, I travelled to the Wagga Eisteddfod on the back of my mother's bike, as there was no petrol available due to rationing', states Pauline. For tap dancing entrants in the Wagga Eisteddfod, the Carabost Cup Championship Ensemble section was the pinnacle of their amateur stage career. Pauline won this event and many other championship events during the 1940s. Pauline was also a successful competitor in the City of Goulburn Eisteddfod and the City of Sydney Eisteddfod. Wartime fundraising events at the Forest Hill RAAF Base and the Uranquinty RAAF Base were also a feature of Pauline's amateur dancing career in Wagga. In 1945, at the age of 15 years, Pauline auditioned successfully for the Tivoli Theatre in Sydney. Pauline's professional dancing career began in 1946 when she went on to perform in stage productions in Sydney, Brisbane, Melbourne, Adelaide, Hobart and New Zealand. Pauline returned to Wagga in 1954, where her career as a dancing teacher and choreographer began. In 2005, Pauline Harvey became the teacher and chorus member of the Timeless Tappers dance ensemble. They perform at many venues throughout Wagga and district.